A12-920 – Made out of Epoxy resin for the D75DP-920 pediatric model. Anatomical crown, straight root, hollow pulp cavity. Available in tooth #A, B, F, I, J, K, L, S, and T for endodontic practice. 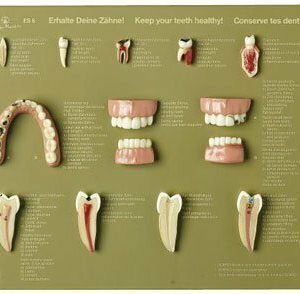 Price is for each tooth and varies depending on whether or not there is wax in the pulp chamber (noted in the drop down menu). Please note, teeth are usually sent with screws. If you need teeth screws, you can purchase them separately.